The Dabao’en Temple is located in the Changganli District of the Nanjing City, Jiangsu Province. The site was an imperial temple in Ming Dynasty. The site extended to Qinhuai River in the north, Yuhuatai in the south, Yuhua Road in the west and the Ming Dynasty burial of Yu Tonghai in the east, with a total area around 25 ha. Dabao’en Temple can be regarded as one of the most prominent temples in Buddhist history. The temple was devastated during the 1600 years span started from the era of Eastern Wu to Qing Dynasty. During the Eastern Wu period, Buddhist Vihara and Emperor Asoka Stupa were constructed in this place. The Changgan Temple was constructed during the Eastern Jin and Southern Dynasties periods. In Dazhong Xiangfu period during the northern Song, eminent monk Kezheng gained support from Emperor Zhenzong to rebuild a new temple in the remaining site of Changgan Temple together with a nine-storey Buddhist Tower. In the second year of Tianxi reign (1018), Changgan Temple was renamed as Tianxi Temple. In the sixth year of Yongle reign, a fire had devastated the Tianxi Temple. In the tenth year of Yongle reign (1412), Emperor Zhudi ordered the Ministry of Construction to rebuild the temple in accordance with the “Style and Regulations of Imperial Structures” and renamed as Dabao’en Temple. The size of Dabao’en Temple during the Ming Dynasty was huge in its time with two individual parts separated in north and south. North part was the main part of the temple with religious structure scattered around the area. For the south part, it was mainly for managerial structures and living facilities. The Dabao’en Temple was destroyed during the Taiping Rebellion in 1856. 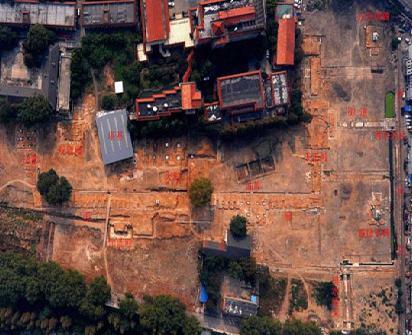 Started from February 2007, in order to facilitate the construction works of the Dabao’en Temple Site Garden, the State Administration of Cultural Heritage approved the Nanjing City Museum to organize an archaeology team to fully excavate the north region. The field excavations were completed in November 2010. Through the excavations within 4 years, the total excavated area was around 36,000 square meters. Prominent findings can be summarized in three aspects. First of all, features from Dabao’en Temple during the Ming Dynasty were identified on the axis of the site. Main structural features including bridges, pathway, Heavenly King Palace, Gigantic Palace, Guanyin Palace, Meditation Hall and etc were identified. In the two sides of the axis, two Imperial Stele Pavilion from Yongle and Xuande were discovered together with structures and facilities such as Jialan Palace, gallery, river dam, discharge culvert, well and boundary wall. Apart from Shanmen and Master Palace, all structures dated from Ming Dynasty were cleared in the north region of Dabao’en Temple. The excavation confirmed that major structures were built along the axis of the temple from east to north with various rooms near the colonnade along two sides. The layout of Imperial Temple during the Ming Dynasty was delineated based upon the characteristics of the “Style and Regulations of Imperial Structures”. The excavations can be regarded as the first full-coverage fieldwork in China at a Buddhist temple site. The site not only provides invaluable information for studying the transformation of Chinese Buddhist Temple but also the layout of Ming Dynasty Temples. Secondly, the foundation of the Changgan Temple tower and underground palace constructed during the Northern Song were identified in the highest area of the site. The base of the tower was in an octagon 31.8m in diameter and 12.1m in the length of each side. The centre of the tower base was the oval opening of the underground palace 2.2m in diameter. The underground palace was a vertical pit 6.74m in depth dug into the earth of mountain It was by present the deepest Buddhist Tower underground palace in China. More than 12000 artefacts were unearthed from the underground palace. The values of these artefacts can be expounded in three ways. First of all, a set of sarira container from Song Dynasty including stone case, iron case, Emperor Asoka Stupa, painted case, silver box, golden coffin, silver cases in different sizes and crystal jar were identified. These are the most prominent materials in studying the sarira system in Song Dynasty. The Emperor Asoka Stupa was huge with elegant decorations, which can be regarded as the largest, most elegant and most complicated Emperor Asoka Stupa. Other than that, more than a hundred well preserved silk fabric from Song Dynasty were unearthed, which is a rare case in Chinese archaeological history. These fabrics including silk, damask silk, patterned silk, brocade and so forth. A number of techniques such as jacquard, embroidery, dip dye, and gold painting were seen. Among these fabrics, a calligraphically decoration from an alms giver during the Song Dynasty was also identified. Last but not least, large number of spices from Song Dynasty including agar, sandalwood, frankincense, myristica, cloves were unearthed. The utensils and containers for spice such as spice holder, box, spoon , stick , stove and jar were also identified. The Changgan Temple underground palace was another prominent discovery after the discovery of the Famen Temple underground palace in Xianxi in Chinese Buddhist underground palace archaeology. This specific discovery plays a dominant role when studying the construction style and transformation of Buddhist Tower underground palace in China, metal of Song Dynasty, silk fabrics and associated items as well as spice history and usage. Furthermore, the Changgan Temple Tower foundation and underground palace was located in the axis of the north region of the Daienbao Temple in Ming Dynasty. This excavation also explained that a renowned Liuli tower was constructed on top of the tower foundation during Ming Dynasty.